Preprint advertising, a long-reliable source of business that represents a quarter of the remaining revenue for the struggling newspaper industry, is at greater risk than ever before, owing to a perfect storm of challenges. Representing some $5.2 billion a year in sales in 2011, advertising inserts from companies like Best Buy, Target, Kohl’s, Home Depot and Kmart represent the second largest revenue stream left to an industry that has lost half of its sales since revenues peaked at $49.4 billion in 2005. The only bigger revenue source for publishers are the local retail ads carried in the pages of their print editions. The growing importance of the preprint business to newspapers in the last five years is illustrated in the pie charts below, which show that preprints represented 26% of the industry’s $4.4 billion in sales in the first quarter of this year vs. 17% of the industry’s $9.8 billion in revenues in the first three months of 2007. Preprint advertising has a significant impact on the industry’s profitability. “Preprint advertising accounts for 70% of the Sunday revenues at the average newspaper,” said one industry leader who declined to be named because he is not authorized to speak for his organization. With the Sunday paper producing “most of the profitability” for many publishers, he added, the health of the preprint business has a direct bearing on the bottom line of almost every publisher. A major drop in preprint revenue would be “draconian” for the industry, agreed Caroline Little, the chief executive of the Newspaper Association of America, in a telephone interview. ∷ The digital revolution, which is (a) unraveling the business models of many of the big-box retailers who historically have been the biggest buyers of preprint advertising and (b) encouraging even healthy bricks-and-mortar retailers to shift from high-priced print advertising to targeted and inexpensive digital formats. ∷ A favorable rate cut granted last week by the U.S. Postal Service to Valassis Communications, which will enable the direct-marketing company to mail certain types of national retail preprints for 42% less than newspapers are required to pay for the same product. The NAA says the Valassis deal could divert no less than $1 billion in advertising revenues from newspapers to the direct-mail company, which generated more than $2 billion in sales in the last 12 months by mailing its Red Plum ad circulars to consumers. The above developments put publishers are in a classic squeeze, where they are being forced to battle declining customer demand at the same time they are being undercut by a newly empowered, low-price competitor. Exhibit A in the “declining demand” side of the equation is BestBuy, the last-standing, national big-box retailer of computers, consumer electronics and appliances in a field once crowded with the likes of such faithful preprint purchasers as Circuit City, CompUSA and the Good Guys. Best Buy, which reported a 90% drop in profits in the second quarter of this year and told investors it could not offer any earnings guidance for the balance of 2012, is being decimated by Amazon and other online merchants, who can afford to charge less than Best Buy for laptops, TVs and dishwashers because they don’t bear the expense of operating bricks-and-mortar stores. In the interests of maximizing its marketing efficiency and efficiently connecting with consumers through digital media, Best Buy cut its purchase of newspaper preprints to $257,000 in 2011 from more than $1 million in the prior year, according to Advertising Age. At the same time Best Buy trimmed its preprint spending by 75%, the company boosted Internet advertising by 40% to a bit less than $23 million. Beyond Best Buy, some of the other long-time preprint buyers suffering from challenged business models include Radio Shack, J.C. Penney, Sears and Kmart. A recent study by Group M Next, a market researcher, found that 45% of consumers say they would abort a transaction in a physical store if they could find a discount as low as 2.5% from an online retailer. Even thriving bricks-and-mortar retailers today are trying to improve the efficiency of their marketing by seeking low-cost and highly targeted advertising options. Major retailers like Target and Safeway are not only putting more of their ad budgets into digital media but also are seeking to establish direct relationships with consumers through their own websites and the social media (as discussed previously here). The local and national retailers still relying on preprint advertising in newspapers are demanding that their circulars go only into papers delivered to specified Zip Codes. With insert quantities limited, publishers often run out of highly prized Sunday ads for single-copy papers, angering incidental readers they would like to convert into regular subscribers. At the same time advertisers cut preprint allocations, they are demanding ever-greater discounts in the delivery fees that publishers charge. Discount-hungry advertisers will have fresh ammunition in dealing with newspapers as a result of the decision last week by the Postal Regulatory Commission, the body overseeing the postal service, to grant Valassis a significant discount in mailing rates for circulars it delivers for durable and semi-durable products sold by national brands. The discount will let Valassis mail a nine-ounce bundle of inserts for 17.2 cents apiece, or nearly 42% less than the 25.4 cents per unit that a newspaper would pay for an identical package sent to a non-subscribing household in its delivery area. Prior to the adoption of the new discount, Valassis and other saturation-mail services already were being charged 3 cents per piece less than newspapers. The Valassis discount, which does not apply to ads it already mails on behalf of local retailers, requires the company to boost its volume by 1 million pieces within 12 months. If the company hits the goal, the discount will apply for three years and the financially challenged postal service estimates it will reap up to $15 million in fresh profits for itself. If Valassis misses the minimum, it will owe the Postal Service a one-time penalty of $100,000. After surveying more than 300 publishers, the NAA calculated that the Valassis discount will put $2.5 billion in existing newspaper ad revenues at risk. Of that sum, the organization predicts that up to $1 billion in business would switch away from publishers, leading the NAA to not only denounce the discount but also to mount a legal challenge against it. While the NAA is asking both the Postal Commission and a federal court to block the immediate implementation of the discount, Valassis will be free to pursue newspaper advertisers unless a stay is issued. It is not unprecedented for the postal commission to grant favorable discounts to major bulk mailers, said Paul J. Boyle, the senior vice president for public policy at the NAA. Credit card marketers got lower rates by promising to increase the number of solicitations they dropped in the mail. As big a challenge as the Valassis deal poses to newspapers, it may not be the only competitive threat facing publishers from bulk mailers. The Smart Source service operated by a division of News Corp. mailed twice as many coupons last year as Valassis, according to Kantar Media, an independent market research company. The threats to the preprint business come at a time that the advertising category has become second in importance only to the ads that local merchants buy in the pages of printed editions. Run-of-paper retail advertising generated $6.6 billion of the industry’s aggregate $24 billion in sales in 2011, according to the NAA. In generating $5.2 billion in advertising in 2011, preprint volume surpassed classified, national and digital advertising sales. Penultimate sobering note: Notwithstanding the stated intention of most publishers to migrate vigorously to digital publishing, printed papers remain the primary revenue source for the industry. Print advertising accounts for about two-thirds of sales, print circulation produces about a quarter of revenues and digital advertising generates only about 10% of revenues. Final sobering note: Although the nation’s publishers collectively sold a bit less that $24 billion in advertising in 2011, they are unlikely to do as well this year. The NAA reported that industry revenues fell nearly 6.9% in the first three months of 2012 and reports from individual companies indicate that the decline continued at about the same level in the second quarter, too. 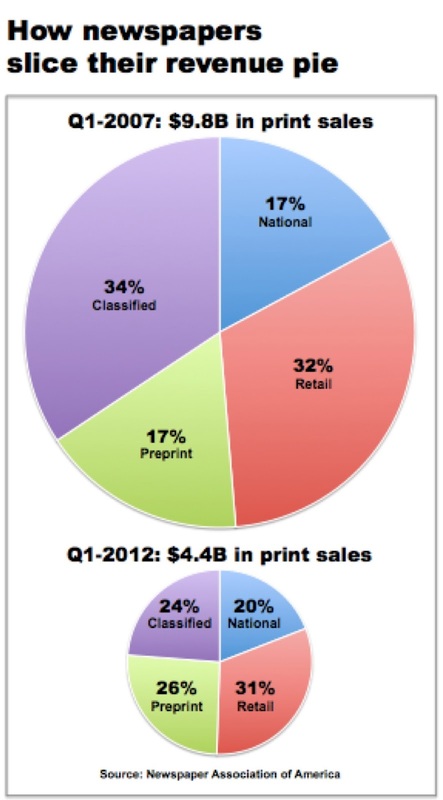 Best buy severely cuts preprints from newspapers and now has a 90% drop in profits. Does anyone else see a cause and effect here? Best buy severely cuts preprints from newspapers and now they have a 90% loss in revenue. Does anyone else see a cause and effect here? Best Buy already was sliding away because of the competition from Amazon. They cut their print advertising after previous losses. They may have lost some business due to less print advertising, but certainly not 90 percent. Best Buy has been the subject of many business stories lately in how they're becoming a showroom for Amazon -- customers come in, check out the products, then go buy it from Amazon for 5-10 percent less. The digital equivalent to a Best Buy pre-print, is the Best Buy website. Same goes for all businesses reliant upon pre-prints. By definition, the place that news"papers" play in delivering an audience has changed similarly. Janet, just to be clear, Best Buy's "revenue" was NOT down 90 percent. It's net profit was down 90 percent, and much of that decline was due to one-time charges, including the closing of some stores. The point remains the same: Best Buy is running fewer preprints because it has found less expensive ways to advertise. All of these companies listed have absolutely refused to evolve. Now faced competitors outside of their reference set taking their lunch. All that can be done is write sad blog post that will never be read by guys who are still carrying blackberrys and flip-phones. I've met these all of these guys. Nice people. There are lots of reasons for why this occurred, but very little that can be done.